Geovision surveillance DVR kits supplied by CCTV Camera Pros include a Geovision DVR card, 4, 8, or 16 security cameras, and plug and play CCTV cables. CCTV Camera Pros offers your choice of security cameras and we can also mix and match any camera on our website for a custom surveillance kit. 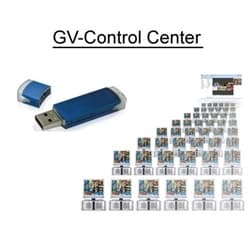 Tom: Hi, I am interested in purchasing your PRO-GVK4B Geovision DVR Card Kit. I have a couple of questions. The first question is how are these security cameras powered? and the second question is what is the frame rate for the video? * Welcome Tom! Your request has been directed to the Customer Service department. Please wait for our operator to answer your call. * Call accepted by operator Customer Support. Currently in room: Customer Support, Tom. Customer Support: Hi Tom. I am finishing a call. Can you please hold for 1 minute? Customer Support: The cameras are powered by DC power supplies that come with the 4 camera kits. The 8 camera DVR kits come with power supply boxes. Customer Support: The framerate for the video depends on which Geovision card you choose. The GV-650 is a 60 FPS card. The GV-800 is a 120FPS card. Divide the framerate by the number of cameras that will be recording at the same time. Max frame rate per camera is 30FPS. Tom: ahh ok, so the GV-650 for example will only do 15 FPS per camera? Customer Support: if 4 cameras are recording at the same time, that is correct. Tom: I see. my problem is this, I need to power these cameras, without running an extra DC power line to them. how I can better explain that. Customer Support: The plug and play cables also run the power. The same with RG59 siamese cable. Tom: those are purchased seperate right? Customer Support: no. the plug and play cables come in the Geovision kits. one 100 footer for each camera. You can upgrade to 150 foot if needed. Customer Support: correct. no problem. You can take a look at this video to get an idea: How to connect security cameras video. The camera connections work the same for Geovision. Tom: so basically I would need nothing else, just a computer and monitor and I am all set to go if I purchase this kit? Customer Support: 4 cameras right? Customer Support: OK. If you need to upgrade the cables, just let me know. The shopping cart does not let you do that, but you can call 888-849-2288 and we can upgrade you. Tom: how much extra is the upgrade? Tom: not bad Thank You again! Customer Support: Your welcome. Let us know if you have any other questions.